Last year, Lamborghini broke down and joined most of the automotive world in catering to the public’s unrelenting obsession with large vehicles that’s choking other segments of the car market. It did that by debuting the Urus SUV, which, in the most shocking news ever, apparently has “terrific” sales so far. You may all pause right here for a collective gasp. The Urus is part of a buyer craze in which new car purchases are staggeringly dominated by crossovers and SUVs. Take Cadillac, for example: It’s a company that swears by its sedans, yet the one crossover in its lineup as of July of last year, the XT5, was selling at about five times the rate of most of its other car models. That incredible crossover-SUV boom is the same elsewhere, leading automakers to come out with new people haulers every time you turn around. Lamborghini’s version of an SUV money machine debuted with a 4.0-liter twin-turbo V8 and eight-speed automatic transmission, with a claimed top speed of 190 mph. The SUV is rated at more than more than 640 horsepower and 627 lb-ft of torque, with a claimed 0 to 62 mph time of 3.6 seconds. All of that comes for a base price of just over $200,000, but Lamborghini CEO Stefano Domenicali told CNBC people aren’t spending that on it—most of the SUVs are selling for $240,000 or more with added options, he said. Domenicali also told CNBC the sales numbers are great. Specifically, he said the company will end 2018 with total production of around 5,000 cars – more than 1,000 of which will be the Urus. By the end of 2019, Lambo will be producing around 8,000 cars – with more than half being the SUV. He also said the Urus is selling well in Russia and other markets with bad roads that made it hard to sell the company’s low-slung sports cars. To reiterate: Most Urus buyers are new to Lamborghini, a company known for its fast, outrageous and low-to-the-ground performance sports cars that most teenagers have set as their computer background at least once in their lifetimes. That’s probably because the people succumbing to the crossover craze aren’t big into those silly sports cars and their lack of seats or usable space. But there’s no need to worry, of course. 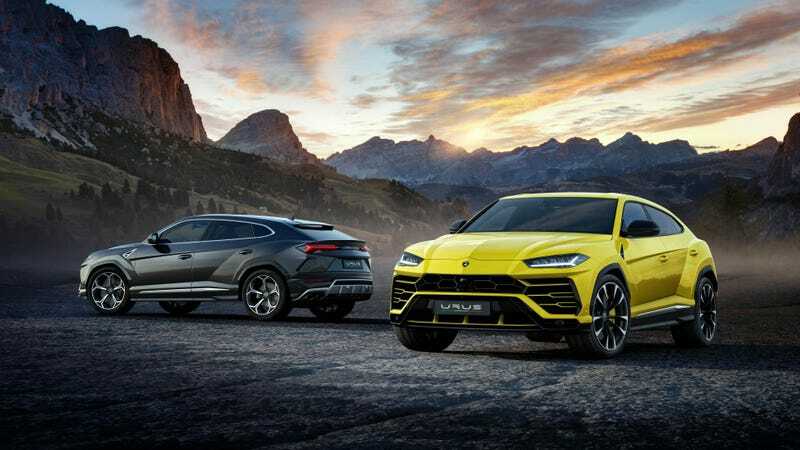 Domenicali admitted that to CNBC that the Urus is polarizing and some more traditional owners aren’t thrilled about Lamborghini selling an SUV. But Domenicali basically said the “SUV” thing is just a shell, and that underneath, the Urus is just a multipurpose sports car. And in today’s world, purpose sells. Everybody has lots of important things to haul to their various destinations, and they need large seats, enough headroom and a spacious cargo area to be able to do that. It’s no wonder the new Urus is selling so well, at least amongst the people who have the money to buy it.